In ChartDirector, a bubble chart is just a scatter chart with variable size symbols. In this chart, two bubble layers with circular symbols are shown. Semi-transparent colors are used so that bottom bubbles can be seen even if overlapped by top bubbles. A bubble layer in which the bubbles are not necessarily circles. Any scatter symbols and user-defined images can be used. 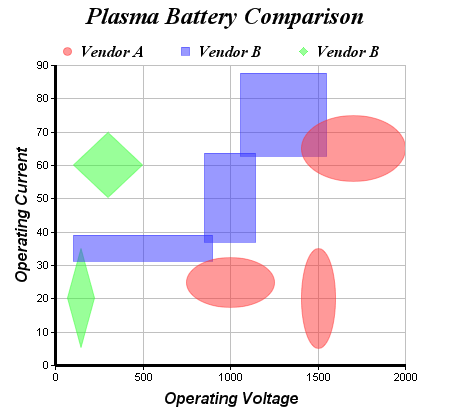 A vector chart consists of arrows of arbitrary lengths and directions at arbitrary positions. 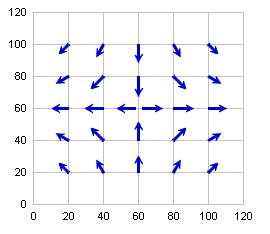 Vector charts are ideal for visualizing flows or other vector fields (eg. magnetic field lines).